Recently-contacted Murunahua man, Yurua River, Peru. The decision was revealed this morning at a promotional event held in London by Perupetro, the state company responsible for promoting oil and gas exploration in Peru. The vast majority of the reserve had been previously open to exploration by Brazilian company Petrobras, in an area known as ‘Lot 110’. 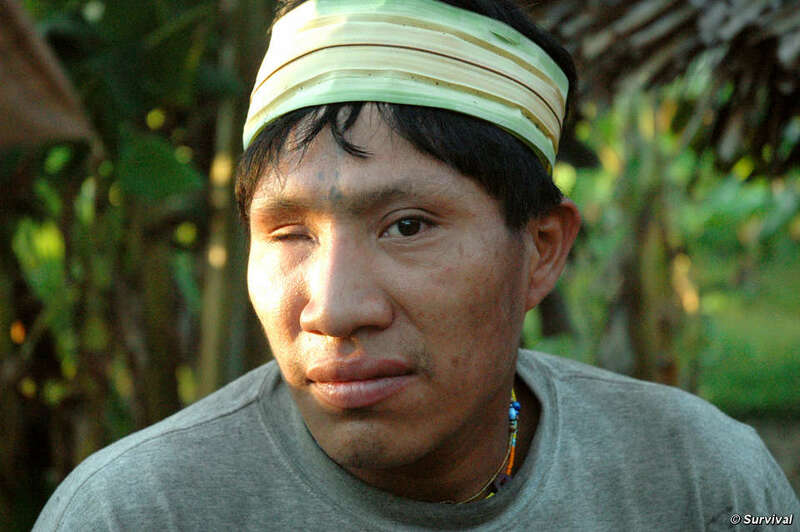 The reserve is inhabited by some of the world’s last uncontacted indigenous people, a tribe known as the Murunahua (or Chitonahua). When some Murunahua were contacted for the first time in the mid-1990s, an estimated 50% of them died. However, Perupetro also announced it intends to open 25 new ‘lots’ for oil and gas exploration, totalling 10 million hectares and almost all in the Amazon. This move has been immediately criticised by Peru’s national Amazon indigenous organisation, AIDESEP, who called it a ‘new provocation’ and a ‘new threat’ to Peru’s indigenous population. Perupetro’s promotional tour began in Houston earlier this week. The company chairman, Daniel Saba, has made numerous inflammatory comments in the recent past, including denying uncontacted tribes exist or that any reserves have been created for them. Survival researcher David Hill has met some of the contacted Murunahua and is available for interview.